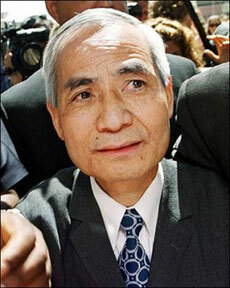 WASHINGTON - US nuclear scientist Wen Ho Lee, once a suspected spy for China, settled lawsuits against the US government and major news media for 1.64 million dollars, the US Justice Department said. Lee, a Taiwanese-born US national who worked at the top-secret Los Alamos National Laboratory -- the birthplace of the atomic bomb -- was fired in March 1999 amid suspicion he helped Beijing obtain top-secret data on the W-88 nuclear warhead, one of the most sophisticated in the US nuclear arsenal. He was arrested in December 1999 and held for nine months in solitary confinement. Despite the US government's investigation of Lee's contacts with Chinese colleagues it never gathered sufficient evidence to prosecute him. Instead FBI agents charged Lee with failing to follow proper procedures on handling highly classified information. Lee was released in September 2000 under a plea bargain agreement in which the FBI was forced to drop all but one of the 59 charges brought against him. Lee then sued the Departments of Energy and Justice as well as reporters from five major US news organizations -- The New York Times, The Los Angeles Times, The Associated Press, The Washington Post and ABC television -- that covered the affair. He accused the government of leaking false information, and the reporters of damaging his reputation. Lee said of the settlement: "We are hopeful that the agreements reached today will send the strong message that government officials and journalists must and should act responsibly in discharging their duties and be sensitive to the privacy interests afforded to every citizen of this country." The payment by AP, The New York Times, the Los Angeles Times, The Washington Post and ABC is the only one of its kind in recent memory, and perhaps ever, legal and media experts said. The companies said they agreed to the sum to forestall jail sentences for their reporters, even larger payments in the form of fines and the prospect of revealing confidential sources. The companies and their reporters were not defendants in the privacy lawsuit. "We were reluctant to contribute anything to this settlement, but we sought relief in the courts and found none," the companies said. "Given the rulings of the federal courts in Washington and the absence of a federal shield law, we decided this was the best course to protect our sources and to protect our journalists." Betsy Miller, one of Lee's lawyers, said the payments show "that both the government and the journalists knew that they had significant exposure had this case gone to trial." Lee was fired from his job at the Los Alamos National Laboratory in New Mexico, but he was never charged with espionage. He was held in solitary confinement for nine months, then released in 2000 after pleading guilty to mishandling computer files. A judge apologized for Lee's treatment. Two federal judges held the reporters in contempt for refusing to reveal their sources to Lee. The journalists had argued that he could obtain the information elsewhere. U.S. District Judge Rosemary Collyer signed an order Friday vacating the contempt proceedings against the reporters, H. Josef Hebert of The Associated Press, James Risen of The New York Times, Bob Drogin of the Los Angeles Times, Walter Pincus of The Washington Post, and Pierre Thomas, formerly of CNN and now working for ABC News. In 2004 a judge sentenced the journalists to pay fines on contempt of court charges for refusing to reveal their sources. The agreement reached Friday puts an end to all lawsuits. According to terms of the agreement, of which AFP obtained a copy, Lee would get 895,000 dollars from the government, mainly to refund legal expenses. The remainder of the money is being jointly paid out by the five news organizations. The agreement shows the "validity and seriousness of doctor Lee's claim," said Betsy Miller, one of Lee's lawyers. Born and raised in Taiwan, Lee moved to the United States in 1965 to study engineering, became a US citizen and was hired in 1978 at Los Alamos as weapons designer. Los Alamos, deep in the New Mexican desert where the world's first atomic bomb was designed and tested in 1945, has long been dogged by security breaches and allegations of spying, theft and fraud at the installation. The laboratory's last head, John Browne, and his deputy quit their posts in January 2003 amid charges of rampant theft, fraud and security lapses at the facility.